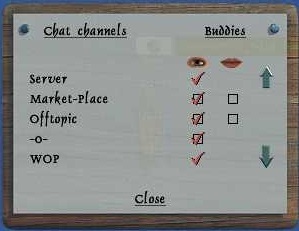 World of pirates has several different chat channels you can use. By pressing the key you use for toggle chat history, the chat comes up like you see here. You can change key for toggle chat history in options under the right click menu. If you press the red x at a channel you will remove it. By pressing enter or the enter key, you selected in options, you get a chat box at bottom of the screen, here it will inform you what chat channel you are in and you can just type what you want to say in this channel and again press enter or the enter key you selected in options. If a channel is write protected, a message will inform you that the channel is write protected and this box to type in will not appear. Note when you got this chat box on your screen you cannot steer your ship. You can also control chat channels at the option buddies/chat in the right click menu. Here you get this chat channel options, where you can select what channels you want to see or not see. Some you cannot deselect. Use the arrows to see all the chat channels. You can also change chat channel here by selecting one under the mouth. Also if you lost a chat channel, you can get it back by ticking it off here. First you got vicinity, which is used to talk to players in your vicinity. Nation chat is used for talking to other players of your nation, each nation has its own nation chat. Tavern chat is used for talking to all players. Newbie-Help is mainly used for asking questions and getting answers. Market-Place is where you can trade stuff like selling ships or specialists. Offtopic can be used to whatever people want to talk about. WOP is a channel is write protected and you cannot type in it. Here you will get info on gold paid in tax, gold paid for anchorage, gold paid to specialist. Warning when you see land or ships. How many sea miles you sailed will be told every 1k naut.miles and get 500 navigation bonus. And when entering or leaving newbie areas. Clan chat will appear when entering a clan. Team channel will appear when entering a team. Server channel is write protected and will sometimes appear with important server information. Like if the server will be taken offline for some time.